﻿ Tee Stackers New Softball and Baseball Hitting Aid. Read About The Garber High School 3 Ball Club! Instant Feedback On Every Swing! Gametime Training Tools is proud to introduce Tee Stackers,™ an exciting new training tool for baseball and softball players. The Tee Stackers unique design allows you to "stack" two or three balls on a hitting tee at the same time. Stack two or three balls on the tee at one time by placing a Tee Stacker between each ball. Use different sizes and colors of balls while changing hitting planes on each swing. Can be used with a single or double tee. Use Tee Stackers to create challenging hitting drills and stations at practice. Players will receive instant feedback on the correctness of their swings, helping to improve mechanics, even while working alone. You can use any combination of different size balls to enhance focus. The Tee Stacker 2-Pack includes two Tee Stackers, two attachment cords with locks, and a mesh carrying bag. Directions and basic drills are included in the package. More advanced drills are available in PDF format for download on the sidebar. Online: Secure shopping cart and payment through Paypal. Use your Paypal account or credit card. Click on the order link from the main menu. Phone: Call us at 405-880-6789. 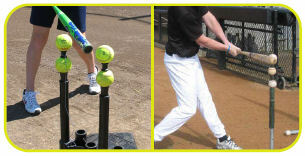 "I really love the Tee Stackers and was impressed with how they make you focus on the balls and keep your swing level. 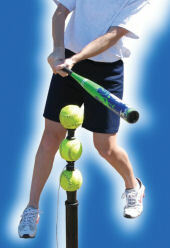 The Tee Stackers make hitting off the tee more fun and challenging! I plan to include them in my new drill book coming out next year." "If you are looking for a way to teach the proper pathway through the strike zone, well the Tee Stacker will do that for you even if your are not there. This is an inexpensive device that a team or individual can use to teach a proper bat path through the zone to extension. I use it in my private lessons in both softball and baseball and with my professional baseball players. It's just another great tool to help our young athletes." "Tee Stackers give instant feedback for hitters that want to perfect their mechanics and increase their power by hitting thru the ball. Perfect for station work at large camps or practices when coaches are not always around". "I like products that encourage players to practice and the "Tee Stacker" does just that. It's a fun way to challenge the student's eye-hand coordination." Click below to see a list of Camps, Training Facilities, and Professional Players nationwide using Tee Stackers.